Brandon Clary, CEO of Edgefield County Hospital, resigned his post, December, 3, 2014, effective immediately, according to an announcement received by The Advertiser from the hospital, Thursday, Dec. 4. This resignation comes on the heels of a lengthy discussion on ECH held by Edgefield County Council at their regularly scheduled monthly meeting, Tuesday, Dec. 2, that included a vote to, among other things, reconstruct the makeup of the hospital’s board. The meeting also included a presentation of concerns about practices at the facility and talk of possibly removing funding for ECH and for possible investigations into the financial practices at the hospital. Clary’s leaving also follows the recent resignation of the hospital’s CFO, Kelly Cox. The first item on Council’s agenda regarding ECH was consideration for an ordinance that would reduce the number of board members for the facility from nine to five. One member would be appointed from each of the County’s five districts, and each member would be required to reside in the Council district from which they are appointed. The ordinance also sought to establish the terms of the initial members of the new board and to specify procedures for the board which would include providing Council with the hospital’s budget for the succeeding fiscal year. It would revise powers and duties of the board, clarify limitations on indebtedness issued for the hospital, specify reports and audits that may be required by Council, require the board to follow certain fundraising procedures, and establish a Council Liaison position to the board. The changes to the makeup of the board would become effective March 3, 2015. Council’s agenda stated this move was in order to increase coordination and communication between the hospital and the County. Speaking to his support of the measure, Councilman Rodney Ashcraft said, “I totally concur and appreciate the effort in this.” The acceptance of this ordinance on first reading passed unanimously. Following discussion on the aforementioned ordinance, Councilman Ashcraft was listed on the agenda for discussion on ECH. Opening with thanks to the board members currently serving the facility and noting the presence of the only board member in attendance at Council’s meeting, Connie Sutton, Ashcraft went on to say he believed there were a few matters at the hospital that need attention. From there, Ashcraft proceeded to list those matters, starting with questions regarding salary and benefits at the hospital which he said has risen from $5.9 million in June to $7.8 million in October. He also reported that 7 new positions had been created that report directly to the CFO of ECH. Ashcraft questioned financial practices at the hospital citing one incident in particular where there was no receipt or acknowledgment of a patient room donation. Saying there was “a little cloudiness” as to where the money was going, Ashcraft went on to question where money went from two recent fundraisers for the hospital, one at the National Wild Turkey Federation and the other being the hospital’s gold tournament. Another matter of concern highlighted by Ashcraft was reimbursements to ECH from Medicare that Ashcraft maintained were scheduled to begin in October. However, Ashcraft said that thus far, no money had been reimbursed. He said the reason for this was first given as due to a letter with a deadline being turned in late, but he said later the reason was changed to being a result of ECH not meeting inpatient numbers. Ashcraft also questioned the recent moving of administration from ECH’s campus and said the vacated space was not being utilized as it had been stated it would be used. Ashcraft also alleged that there was missing information from the hospital’s servers. Saying he would like to see more authorizing signatures signing off on items, Ashcraft also recommended that a financial investigation be conducted to look closer at the institution’s financial practices. At this recommendation, an audience member called out for a forensic audit at the hospital. Ashcraft responded that he would vote to support such an investigation should it come before Council. In response to Councilman Ashcraft’s presentation, Chairman Dean Campbell said, “Nothing would make me happier than to see a very successful Edgefield County Hospital.” He went on to suggest that since recent financial reports indicate the facility is doing well that Council consider reducing the millage the hospital receives. Councilwoman Genia Blackwell concurred that it does appear that the hospital is becoming more self-sufficient and said due to this, she, too, was in favor of reducing ECH’s millage. However, Blackwell also said she would like to see the financial activities at the hospital be looked into further and called an investigation “timely with recent resignations [that of the hospital’s CFO].” Saying she did not want Council to get too involved, Blackwell reminded that Council does have a responsibility to the County’s tax payers and asked what options were available to Council in regards to this matter. County Attorney Jim Holly stated he could confer with a certified public account in regards to the types of audits that might be conducted. Holly said Council could authorize him to look into the matter and recommended looking into more details before moving forward with any action in regards to these matters. A motion was ultimately made to give Holly and County Administrator Lynn Strom authority to move forward with looking into different avenues Council might take relating to the financial situation at ECH. The Advertiser reached out to Councilman Ashcraft for comment on Clary’s resignation, but he declined to comment. 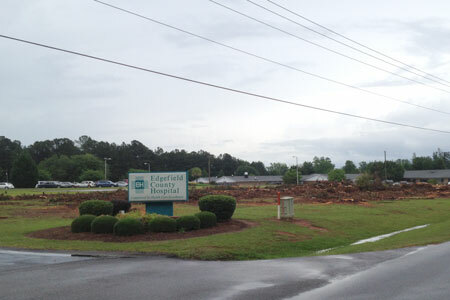 Chairman of the Edgefield County Hospital Board of Trustees, Tim Williams, did speak with The Advertiser on Friday regarding the loss of Clary and said, “We [the board] accepted his resignation … we [the board] appreciate his efforts in Edgefield.” He went on to say the board is “moving forward now” and is looking for an interim until a full time CEO can be found. As to the Council meeting, the actions taken there, and the concerns presented regarding ECH, Williams declined to comment at this time.